Hello and Thank You for checking out our latest listing of another Restored Avanti by The Motor Masters! 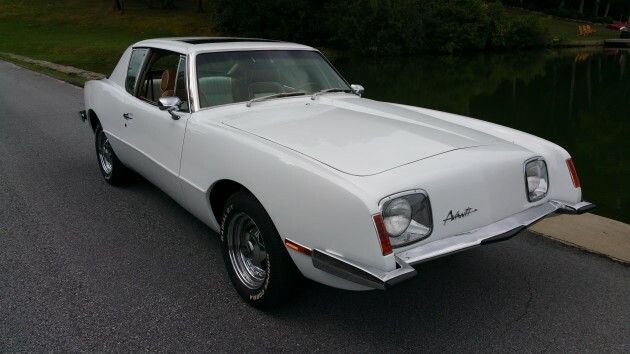 Up for sale is a Classic Avanti II with ONLY 58,000 ORIGINAL MILES!!!! White with Tan Interior. BRAND NEW LTI Camaro 350 Engine that has 320HP with 3 Year 50K Miles Warranty! Also has 4 Speed 4L60E GM Automatic Transmission. Both of these are UPGRADES…NOT STOCK. With Dual Exhaust, this gives the Avanti GOOD PERFORMANCE. Has a BRAND NEW PAINT JOB( 3 Coats Base and 3 Coats Clear). Has Power Steering & Brakes, Tilt & Cruise Control, Power Door Locks and Windows. AC Blows ICE COLD and is switched to R134, which also includes a NEW Compressor and Dryer. Steering Wheel is Factory. All Gauges work, including the Clock. Has 5 Spoke Wheels and BRAND NEW Hankook Tires. BRAND NEW AM/FM Radio(Dual) with USB Port, Speakers, and Antenna. Interior, Headliner, Seats, and Dash are in Extremely Good Shape. All Chrome and Stainless Steel is a 7 out of 10. Autocheck Score is 67…WAY ABOVE 15-36 RANGE!!! This report was purchased last October 11th since Autocheck only goes back 30 years and can provide a copy of the report. BUY WITH CONFIDENCE!!! I HAVE A 100% POSITIVE FEEDBACK RATING FROM ALL MY CUSTOMERS!! CHECKOUT MY OTHER ITEMS UP FOR SALE!! !